There's nothing like a light-bright coat to turn an otherwise drab outfit into something fab :) Hope you all have a great week! That coat is stunning! I love it!! Arghhh..I can't believe the coat is old!!! I need and want! Such a lovely outfit! Your Louboutin is a So Kate or a Pigale? I adore this outfit and your makeup looks beautiful!! That coat is everything! What a gorgeously elegant look! I love that mohair yellow jacket, such a fun pop during the winter months! Love this look! I practically have the same color palette in my post today! I love everything about this outfit. I need that coat! Great colour on you! Love the yellow! I love your yellow coat! Such a fun look for transitioning into spring! I love the pants too, girly! 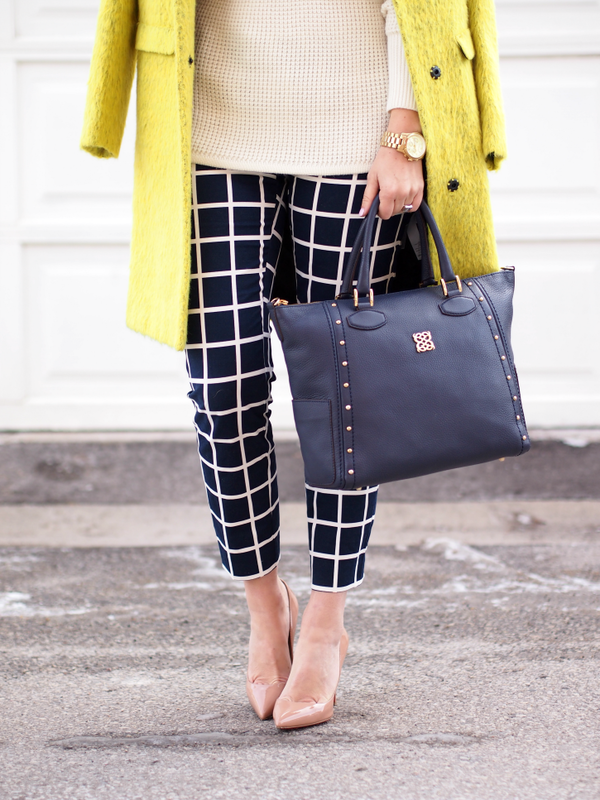 This yellow coat is amazing. What a great colour, shape, and texture. Looks perfect with these pants! That coat is beautiful. The texture is amazing and that color goes great with your hair! Lovely outfit especially your bright yellow coat!!! Love those Gap pants! Got them super cheap last year when they went on sale! You look incredible, I love love love that coat!